HP Just Built a Gaming Laptop. Seriously. Once upon a time, a tiny company called VoodooPC built some of the most incredible gaming computers around. 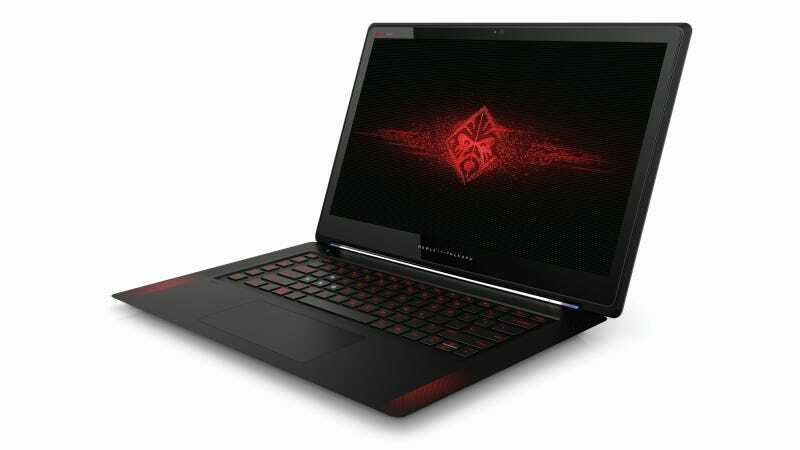 Now, its owner HP is paying homage with the Omen — the first serious gaming laptop the company has ever made. No, the Voodoo brand is not coming back, and the Omen doesn't offically have "VoodooDNA," despite the throwback logo prominently displayed on its screen. Available later today starting at $1,500, the HP Omen is simply a potent gaming laptop gunning straight for the Razer Blade. In other words, it's not a giant brick: Like its Razer rival, the Omen is a sleek, matte black anodized aluminum machine under an inch thin, with a unibody chassis milled from a single block of metal. Inside, you'll similarly find a quad-core Intel Core i7 processor, 8GB of memory, and midrange Nvidia Maxwell graphics on tap. While it's only GTX 860M graphics in the Omen instead of the GTX 870M in the Blade, HP claims the Omen's cooling solution makes a difference — not only keeping the laptop's surfaces cooler but giving that graphics chip a little more headroom. In order to get the airflow just right, HP says it had to raise the laptop's chromed hinge quite a bit — which also made room in back for its four USB 3.0 ports, HDMI socket, Mini DisplayPort, and headset jack. HP's USB to Ethernet adapter comes bundled with the system. The Omen is the teensiest bit heavier at 4.68 pounds and thicker at 19.9mm, but you get some extra bang for that buck: a larger 15.6-inch touchscreen, HP's extra-wide touchpad, speakers with Beats Audio, and a specially-tuned keyboard with six programmable keys and programmable RGB backlighting. What you won't find is a crazy high-res 3200 x 1800 display. Instead, HP goes with a more framerate-friendly 1080p panel with 70% color gamut and wide viewing angles. While you can't upgrade most components, HP will offer configs with 4GB of video memory, 16GB of RAM, as well as faster, higher-capacity PCI-Express solid state drives that allow the machine to boot in five seconds flat. Hit the image's "Expand" button for a closer look. Clearly, we'll need to get our hands on the HP Omen to see how potent the laptop might be, but one important customer is already impressed. Rahul Sood, the outspoken founder of VoodooPC, told me he couldn't find anything he didn't like about the new laptop. "To be honest, when they brought it to me, I was looking to be disappointed, but I'm not. It's quite good," he said. That's pretty high praise coming from the guy who saw the brand he built wither and die at HP, and who serves on the advisory board of Razer — which just so happens to build this laptop's prime competitor. Incidentally, Sood just left his latest job at Microsoft Ventures to create a new game-centric startup. We're eager to hear if his new company, Unikrn, will build some killer gaming hardware of its own.